I’m Giving Away a FREE Laptop! Actually, I’m not, but you can still get a FREE laptop by finishing reading this post. Hey, give me a break – I needed an attention grabbing headline. 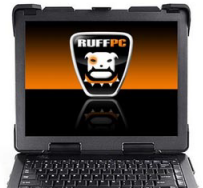 Ruff PC is giving away a water resistant, spill proof, rugged notebook called RuffBook Tech to one lucky winner of the contest they’re holding. Think of this as an early Christmas present. If you’re the clumsy type or the kind of person that likes to blog in the rain, you’ll really appreciate a laptop such as this. The contest is pretty simple; unless you’re an idiot. Basically all that is required of you is that you blog about this contest (like I’m doing). Mention a few things about the laptop itself, such as how durable it is and then submit your entry. The contest runs until Dec. 20th and the winner will be announced on Dec. 25th.